And now, after spending the last five years developing the most powerful market analysis and trading tool on the market, Tom's showing readers how to capture gains of 100%… 200%… and beyond to you today through his remarkable Money Calendar tool. The Money Calendar is Tom's proprietary system that crunches through 10 years of daily transactions, not only on the best ETFs, but also on more than 300 of the world's most liquid stocks – like a codebreaker. He sifts through extraordinary patterns nobody else can see, that repeat over and over again with a 90-100% consistency. As if that wasn't enough, Tom also uses a power meter to pinpoint only the patterns that are getting stronger – give you the best possible trade. It's that consistency that allows Tom to “schedule” gains on his calendar… like potential “Payout Appointments” that hit within 30 days' time. Tom's Money Calendar is something nobody's dreamed of before, let alone seen in the marketplace. But remember, the Money Calendar is Tom's proprietary, utility patent-pending, tool. It's not available to anyone at any price. This first-mover advantage is worth millions. It's the kind of head-start the Wall Street fat-cats don't want you to have, and it's stuff nobody else has dreamed of, let alone seen. It's available now, and it will both pull back the curtain on how real traders work, and lead you to potential gains of 100%… 200%… and beyond on even the smallest stock market moves. It doesn't seem possible to get the kind of detailed information necessary to “trade ahead” of stock price moves. But when you've spent five years crunching over 328 million data points on 3,000 stocks, looking for patterns that happen 90 to 100% of the time for the last 10 years, you've earned the right to a moneymaking tool to call your own. That's where Tom Gentile's Money Calendar Pro comes in. Tom Gentile, America's #1 Pattern Trader, is now a member of the Money Map team. He's going to show you how he uses his proprietary Money Calendar tool to turn information on the top 325 stocks and ETFs into potential “payout appointments” you can literally schedule on your calendar. After a successful and lucrative career in which he taught over 300,000 people his secrets on trading, co-authored four books, and founded – and sold – the world's most trusted financial education company, Tom's back to help Money Map subscribers reach their financial goals. 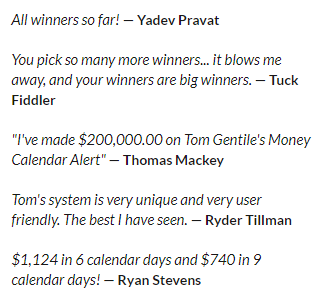 Each week, Money Calendar Pro reveals a trade right in Tom's wheelhouse: a minimum 100% return possibility. That's right: Tom won't even consider a trade unless it has the chance to pay out with a “double.” It's part of his “Money Doubler” strategy that's at the heart of the Money Calendar Pro. Tom's recommendations come with step-by-step video instructions on how to identify and place his trades. In addition, Tom keeps track of every one of his trade recommendations, helping you determine a correct course of action while the trade is active, including “profit-taking” exit strategies.